I'm kind of obsessed with these new little crock pots, they are 4 quarts and only $29.00 at Target. And they work as well as my lets just say MORE than $29.00 Cuisinart one! I may actually need an intervention! I have bought 3 lately because I think it would be great to be able to cook a meal and a dessert at the same time or even a main course and a side dish. 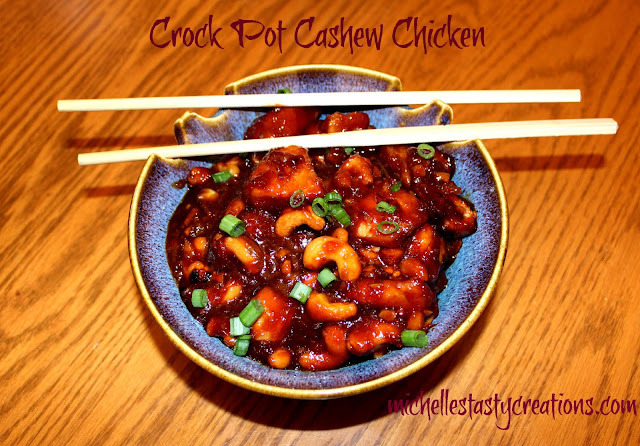 I found a recipe for Crock Pot Cashew Chicken and thought that would be a perfect place to start. In a large zip top baggie place the cornstarch and pepper. Zip closed and shake to combine. Cube the chicken and place in the zip top bag. Zip closed and shake to coat. Heat oil in a large skillet and add coated chicken. Cook on each side 2 minutes until slightly brown. It's okay if the chicken isn't all the way cooked, it'll finish in the crock pot. Mix all the sauce ingredients in a bowl and pour over the chicken. Stir until all the chicken is coated in the sauce. Turn the crock pot on low and cook for 3 hours. Add the cashews about 1/2 hour before finished cooking for crunchy and at the beginning for soft. Sauce will thicken while cooking. Garnish with sliced green onions and serve with my Fried Rice , plain white rice, or noodles. Serves 2 - 4 depending on how many dishes you serve.